Can you ride a mountain bike on the road? I think you can do it successfully. That doesn’t mean you just buy the first one you see. There are aspects and things you should know before you buy one. We feature some of the most important aspects in the following article. We recommend you check it before you buy a certain bike. These aspects will also make your life easier on the road, with much less annoying moments. Although all mountain bikes will work on the road also, some modifications will certainly improve the experience. At the same time, there are some basic aspects that are harder to change and you should also know about them. Weight, tire profile, speed gearing, you name it. Road biking works hand in hand with efficiency. That is minimum drag which results in the minimum effort for higher speed. Always check the weight before you buy. A fiber carbon frame will always have the lowest weight. At the same time, it also costs a whole lot. Steel frames are the cheapest but aluminum is a very good compromise. Excellent weight – A weight around 10.5 kg or 23.5 lbs is great for a mountain bike. You will definitely have a good road experience. Good weight – Between 12 and 13.5 kg is still a decent weight for road biking on a mountain bike. Not the greatest experience but not that bad really. Avoid – Over 14 kg is a bit too high for a road bike, even if you consider that the bike is made for off-road. There are a lot of good mountain bikes in the 13 kg range. Let’s split this subject directly into two categories. We will focus on brakes first and then head to gearing. Brakes – When it comes to brakes, disk braking is catching more and more traction on the market. Disk brakes are getting cheaper and you can find more advanced ones at lower prices. Disk brakes are very very good and we recommend you have them. At the same time, good V brakes won’t kill you either in most cases. If you are investing in disk braking, try and avoid mechanical systems. Go for hydraulic. They do need some maintenance from time to time, but mechanical disk brakes are a pain to adjust. And you will need a lot of adjusting if you use the bike a lot. Gearing – This can be quite a technical subject. Don’t get that much into it. What it basically allows is to maintain the highest speed with the least effort. Ideally, you should aim for a standard 27 speed or 30 speed. Ask the seller he will immediately tell you. Stay away from fancy gearings such as 1×10 or 2×10. That will not help you on the road. I know they might do the same things, but classic gearing works fine and it’s a proven feature. Don’t buy bikes with fancy and expensive gearing just for the sake of buying the best one. For example, Shimano Deore or SLX are very good models. Anything above it won’t help you on the road. XT or XTR models are very good parts but they are built for something different. I always love the tires subject. You can’t go right on this but you can go really wrong. If you are here you are doing a bit of both. Maybe light off road with a bit more emphasis on the road. Manufacturers build tires that can be used on both. Focus more on road or more on off-road depending on what you need. There are choices and the salesperson will help you. Schwalbe, Continental or Maxxis are brands that feature such dual-use products. They are also reliable manufacturers. Don’t go too cheap on tires. They are your only contact patch with the road. They must be good. Don’t overspend. You are in that part of the market where you are doing biking for leisure. If this ends up costing you too much you will consider it a pain, not leisure. Don’t go too extreme. Think well about what you will be doing and pick the middle ground. You will be happy with your choice. Buy a spare tube, just in case you need a quick swap. You will be biking on the road so it’s not nice when you have a flat 50 km away from home. From the start, I must tell you that you should avoid rear suspension bikes for road use. There is no point what so ever to use such a bike on the road. Frist of all, the rear suspension will increase the overall weight of the bike. Weight increases drag, therefore more effort will be needed from your side to move the bike faster. Second of all you will be constantly bouncing. That also increases drag and reduces efficiency. Even if you don’t feel those small bounces it is still inefficient. Third of all, your front suspension should be with air and not coil-based. Let’s just say that this isn’t that important if the suspension itself is not heavy. So you could get away with a coil suspension. But get a suspension blocking tool. That is set up on the fork, and with a click, you can block or unblock the front suspension. 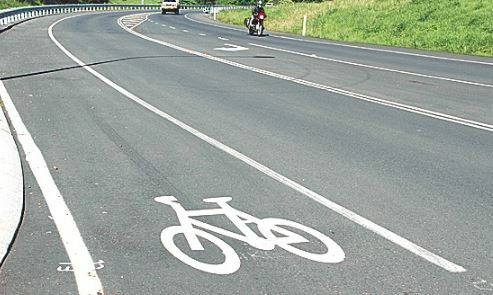 The reason for this is to reduce those bounces when you are pedaling up a hill. Each small bounce transfers energy into that bounce and not into movement. Always avoid doing this. Since the main purpose will be road use, you will be doing long trips. Get on the bike and check if it feels comfortable. Not too big to be too stretched, but not too small to feel cramped on it. Also, get a feel for how you are sitting on it. If for some reason something does not feel natural or it feels forced, try another bike. The more you try the better you will understand which one is comfortable for you. Remember that biking for 3 hours will make you uncomfortable in general. If from the get-go you find something that doesn’t feel right, this will only be amplified after a couple of hours riding. Therefore try and see which one is comfier and in general doesn’t appear to have something that annoys you immediately. The choice you make will be a personal one. Not really objective, rather more subjective. And that is ok because you will be living with it and it has to make you feel good. The pointers above are general pointers from someone that has been doing biking on the road with a mountain bike for some time now. Head to our outdoor category for more information on leisure activities.